The Fourth of July is full of excitement. It’s the quintessential summer holiday, usually spent outdoors with something grilled in one hand and an ice cold drink in the other. As a family, we always went into town and watched the fireworks after a long day of eating, parades and a lots of sun. 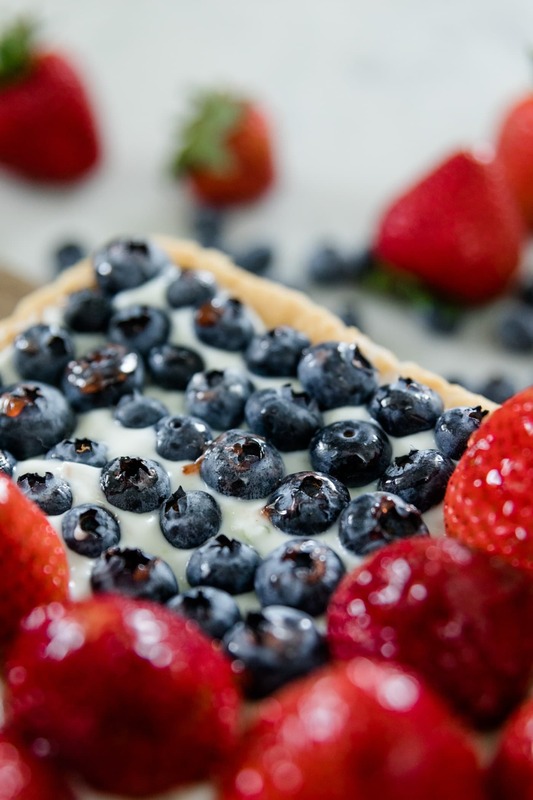 Of course no Fourth of July is complete without something sweet and this cookie tart hits the spot. It’s a delicious combination of sugar cookie crust with a simple fruit and yogurt topping. Make the crust a day before then assemble the day of and you’re ready to go! 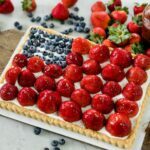 Don’t worry, you don’t have to make this only during the Fourth of July. This dessert is perfect all summer long and can really be made with any fruit! Poached pears that are so deliciously sweet and perfect during the upcoming fall season. Another simple fruit tart that I made a few years ago, but is still high on my list of favorites. 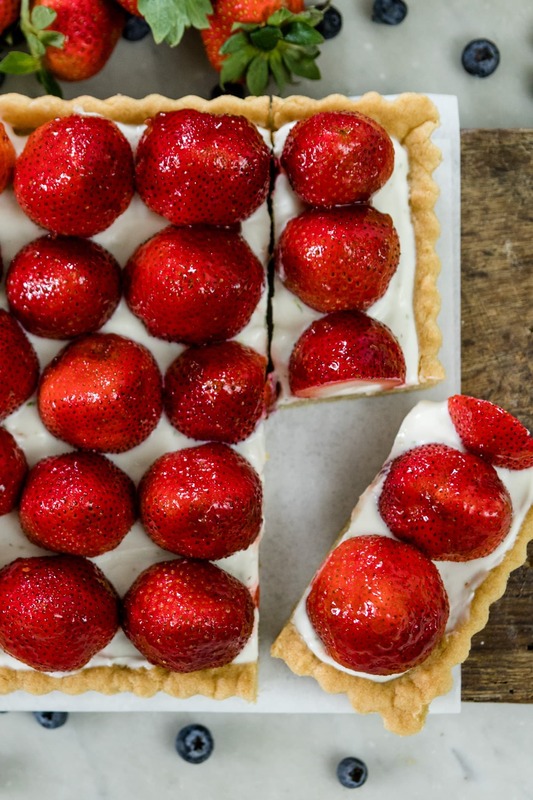 Strawberries and rhubarb together in one shortcake recipe? Sign me up! 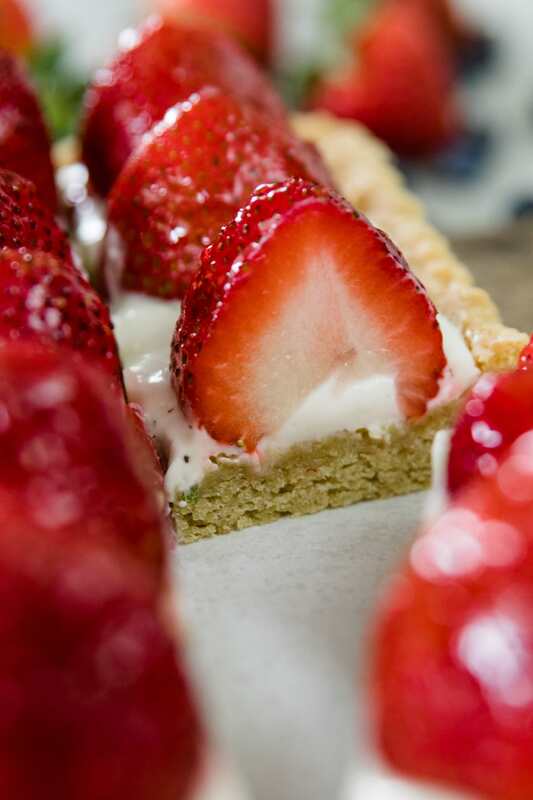 Make sure to leave me a comment and rate the recipe to let me know how this tart turned out for you! 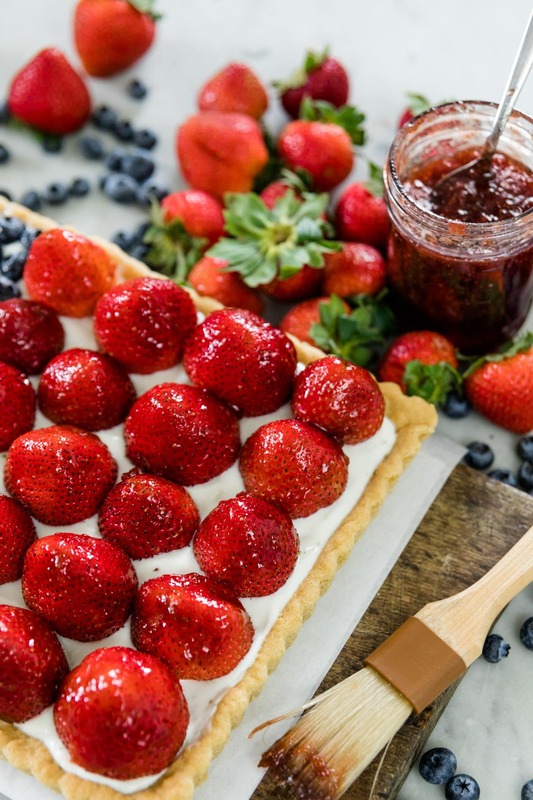 Strawberries and blueberries come together with a cookie tart to form the perfect Fourth of July dessert! This totally works for other holidays as well, so there’s no excuse NOT to make it! In a stand mixer, combine the butter and sugar and mix until light and fluffy. Scrape the sides of the mixing bowl to ensure everything is combined evenly. Add the vanilla and egg. Mix until incorporated. Add the remaining dry ingredients and mix until just combined. Press into a 8×11 tart pan or 9×9 baking pan. Bake until the edges are set and the center has puffed and fallen, 20-25 minutes. Remove from oven and cool. Crust can be made a day in advance or up to one week ahead and frozen. Mix all ingredients together and stir until smooth. Taste and adjust sweetness if desired. Spread evenly on prepared and cooled crust. Place strawberries in rows on top, leaving a corner for the blueberries. Repeat step with rows of blueberries in open corner. Mix together jelly and water and brush on top of fruit. I LOVE your print features here on the website. It makes such nice recipes to cook from! I love that you can customize the spacing and everything else! I’m Kaleb! I'm not a chef, professional baker, landscaper or designer, but I like to play each on The Gray Boxwood Farm. 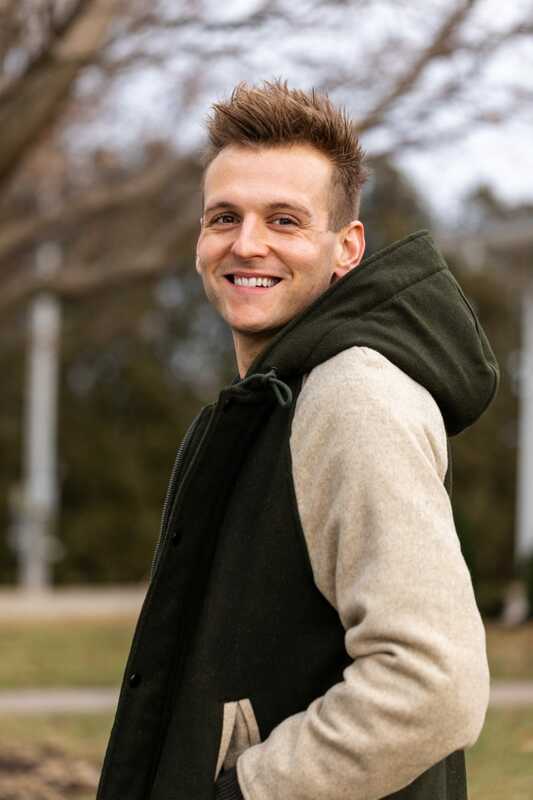 Come join me on my journey and let's learn together!